Along with some gorgeous personalised gifts for Liv, the lovely people at Born Gifted also sent me the ingredients to make mince pies from (somewhat) scratch. Not only did I have to make something I cannot actually eat (Keto all the way! ), but I also had to deal with shortcrust pastry and I am no star baker! Eek! It is tradition to leave a mince pie (and carrot) for Father Christmas on Christmas Eve as a thank you for delivering presents. We tend to use a general side plate for this offering, however this year we are upping the Christmas style stakes with this super cute, ceramic Felt Stitch Friends Personalised Mince Pie Plate (£14.99). With space to leave a mince pie, carrot and a refreshing drink for Father Christmas and Rudolph, the plate is a wonderful keepsake to keep the annual tradition running. If you have little baking fans in your house, than what better gift to give this Christmas than a Baking Star personalised baking set for children (£24.99)! Each wooden baking utensil is engraved with the child’s name and I have to say I am pretty taken with the mini rolling pin! Liv loves to bake, so now we have an excuse to make some of my favourite chocolate cookies over the Christmas break! I am sure by now you are wondering how I got on with baking… well! 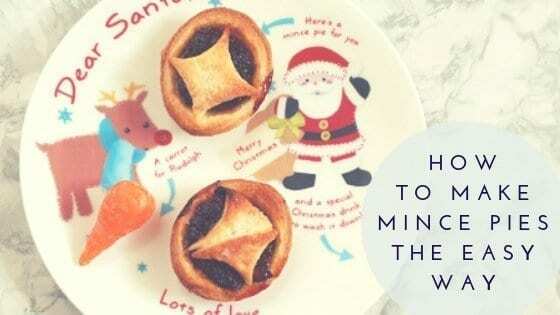 I started by wondering how to make mince pies the easy way… it turns out that it is much easier than expected! If you are short on time, then ready made rolls of shortcrust pastry are a life saver, plus you are left with less mess. However, if you want to know how to make mince pies, this is the mince pie recipe you need! Empty the pastry mix into a bowl and add the water for mixing together to form a firm dough. Roll the pastry out onto a lightly floured surface – ensure the pastry is around 3mm thick. Use cookie cutters to cut as many circles as you can for the mince pie bases and place in a shallow muffin/cupcake baking tray. Fill the centre of the cases with 1-2 teaspoons of mincemeat. Decorate the mince pies with shapes made from the left over pastry to add character to your pies – brushing the edges of the cases and the pastry shapes on top. Bake in the oven at 180 degrees C for 15- 18 minutes. When ready and out of the oven, let the pies cool slightly, dust with sugar and serve! I don’t think I did too badly for a first attempt, though the proof is all in the tasting! The mince pies look perfect when placed on the plate! Will you be making your own mince pies this Christmas? Yumm!!! I haven’t made mince pies in forever I am too lazy but you can’t beat homemade! !